Tropical rainforests are known for their greenhouse gas gobbling abilities, but human impacts may have changed that. According to a study published Thursday in Science, tropical rainforests may be emitting more CO2 than they soak up. 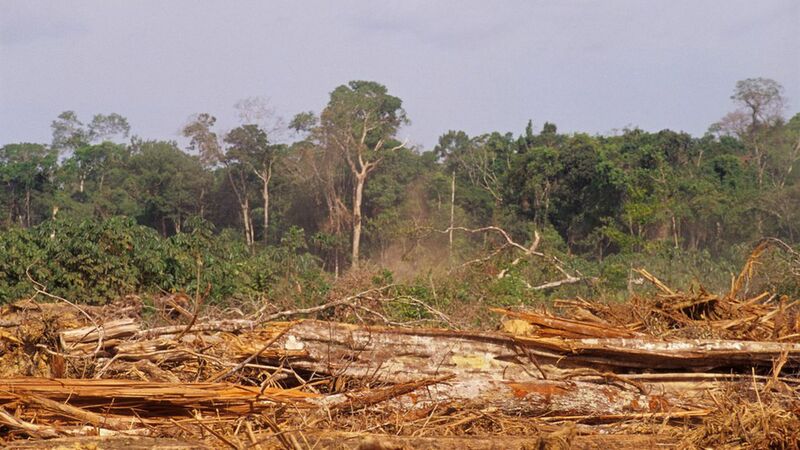 "Much of that carbon contribution is due to deforestation … but more than two-thirds comes from a less visible source: a decline in the number and diversity of trees in remaining forests," writes Carolyn Gramling for Science News. Yes, but: NASA scientist Joshua Fisher told Science News that this study only looked at above-ground carbon. Much CO2 is absorbed by rainforest soils, and atmospheric data still indicates that rainforests are net carbon absorbers, not emitters. What they did: The researchers developed an algorithm that allowed them to measure the carbon density of forests from satellite images, taken yearly from 2003-2014. What they found: According to the study, rainforests emit 862 tetragrams of carbon a year, but only absorb 436 tetragrams/year. Forest destruction emits more carbon than trucks and cars, says Reuters. "This shows that we can't just sit back. The forest is not doing what we thought it was doing," study author Alessandro Baccini told the Guardian. He adds that when it comes to reducing carbon, fixing forests is "low-hanging fruit. We know how to protect and sustain forests. It's relatively cost effective"